Age Group: Under 8 years because of low ceiling height and unit size. 3 in 1 Mini Deluxe Crayon Adventure Fun House Combo! 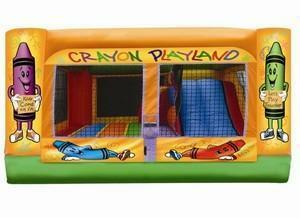 3 in 1 Mini Combo Crayon• 15x15 x 7’ 10’ (H) • Jump, Climb and Slide in this adorable themed unit. Indoor or outdoor unit. Do not operate in winds over 15 MPH Includes tarp, stakes/ground weights and • 1HP Blower 3 in 1 Mini Combo Adult supervision required at all times. Suitable for children 7 years old and under only, minimum height 36" maximum weight 75lbs anyone child. Up to 6 children may be in this unit at one time. Kids ages 3-7 years old can be sorted into small groups to have turns. Children can climb, slide, survive, and play all in one attractive, cleverly designed unit. This 3 in 1 Mini Deluxe Fun House Combo will rent fast, so book early for this sure fire winner!